What is the Buddy Bike? 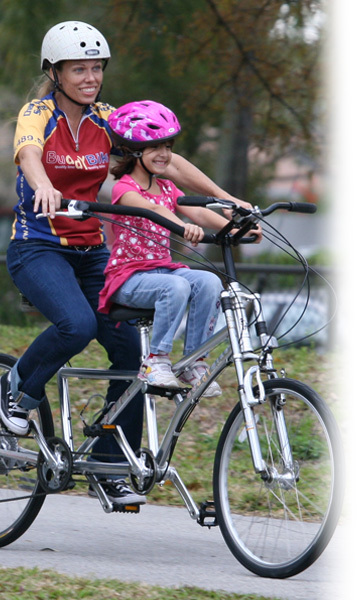 Buddy Bike, LLC manufactures and distributes The Buddy Bike® an alternative tandem bicycle that provides safe family fun and therapeutic activity for cyclists with special needs. Bike for autism, down syndrome, sight impairment and other disabilities. is the Sport Rider Hitch Rack by Hollywood Racks! The Buddy Bike is a "tandem bicycle" although it is shorter than the typical tandem. Some bike racks specify that they are not for use with tandem bicycles. 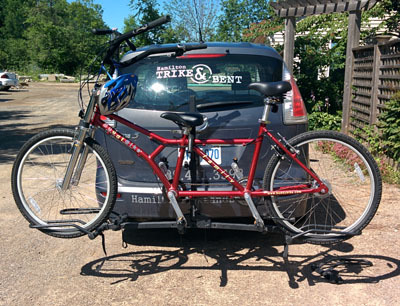 For safety, read your bike rack Owner's Manual before mounting the Buddy Bike on any rack. The weight of the Buddy Bike is approximately 53-62 pounds (without accessories). This weight is well under that required by most bike racks but due to the size and dimensions of the Buddy Bike, not all bike racks could be safely used. Buddy Bike does not suggest any strap rack for carrying Buddy Bikes. Pick up trucks, SUVs and vans are by far the best option for transporting Buddy Bikes. If you don't have any of these options, a hitch rack is your next option. Some vehicles come with a hitch installed. If not, take your car to your dealer to install a hitch. U-haul also provides this service and it will most likely be less expensive. They will select the hitch that is appropriate for your car make and model. The dealer may also install a bike rack but your local bike shop can probably provide a rack at a lower cost. Extra security by anti-sway cradles or straps is highly suggested. Buddy Bike does not endorse any of the products mentioned below nor guarantee the safety of these products. This photo was sent in by one of our Canadian dealers, Cora at Hamilton Trike & 'Bent. She put the Buddy Bike on a standard (not recumbent) Hollywood Rack. It just fits the bike, the wheel saddles are at the end of the bar and the front seat needs to move to put the clamp down. Fits 1.25" hitch. The makers of DraftMaster & Tandem Topper. Models for Every Kind of Cycle - We make racks to carry bikes, trikes, tandems and recumbents. If you have to pedal it we probably make a rack to carry it. Rec-Rac is an Economical rack system for pick up trucks. Buddy Bike is up to 84" long so some pick ups may need to keep rear gate lowered or quick release front tire may be removed. I previously drove a Honda Civic equipped with a hitch and a hitch rack. My hitch was installed by U-Haul but you can also check with your auto dealer. I bought my hitch rack at my local bike shop. You have to match your hitch rack to your hitch size. For example, my rack fits a 1.25" hitch. To make the Buddy Bike extra secure, especially for long trips, I use an anti-sway cradle and straps to secure it to the hitch. My favorite strap to use is a nylon dog leash. The just don't break and are easy to wrap, tie and clip on to the bike and hitch. I ordered the most "stable" hitch rack I could find that will accommodate the [Buddy Bike Family Limited Edition] and essentially supports the weight. The make/model is Hollywood Racks HR1400. It's a "platform" style rack. It can support up to four bikes (200 lbs) but I'll only be using it for now in the two bike configuration (100 lbs). It supports a wheelbase up to 60" and weight of 50 lbs per bike but I think the [Buddy Bike Family Limited Edition] at 53 lbs should be fine since that will be the only bike on the rack. It's an expensive heavy duty unit but worth it to protect my [Buddy Bike Family Limited Edition] and should alleviate any safety issues. We use the Yakima Sidewinder, which is their tandem carrier. As expected, it's actually designed for a longer wheelbase, but it just barely works. It would work better if I took one part over to a machine ship to have them move something around. And their fork mount skewer thing nicely swings out over the edge of the car so you can get it locked in before having to push the bike up. It works quite well. I looked at the Thule 558P, but the single axis pivot didn't look nearly as useful as what Yakima has done. Performance Xport Flatbed 4-bike Hitch Rack Item #40-3560M. The wheelbase on the Buddy Bike is just a few inches too long to fit both wheels perfectly in the wheel slots, but it works quite well anyway. You can strap in both wheels and then I add a bungee cord for extra security. I have a Thule 590R V2 Recumbent bike carrier that I mounted to the top of my Toyota Sienna Mini Van. We traveled over 3,000 miles with it on top of the van this summer while on vacation and it was great. I am able to put the bike on by myself but 2 adult males are recommended to safely put the bike on the vehicle and to remove it. Per Thule North America: "The only carrier we recommend for tandem bikes is our 558P Tandem Bike Carrier for the roof." I own two 4 bike racks. A Yakima and a Thule. the Thule is more friendly towards recumbents and short tandems. Mounts in the hitch on back of a van. Manufactured by DRAW TIGHT (four bike model). I have to remove front wheel due to size. MAKE THE FRONT WHEEL AND BRAKE AS EASY AS POSSIBLE TO REMOVE AND REINSTALL. The front wheel of the Buddy Bike has a quick release for easy removal. Buddy Bike does not endorse any of the products mentioned above nor guarantee the safety of these products. Sign up for Buddy Bike news! known as the Love Bike.